Very cool, I’d like to see a similar guide for android. Why post this now? This article is several years late, this was all possible with iPhone version 1.
alright now how do i do the same thing on a droid ? This is OLD news, and also misleading. 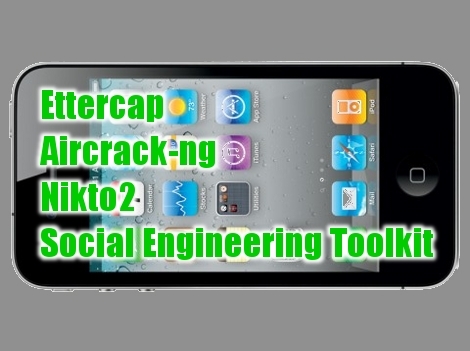 The iPhone will NOT be capable of packet injection, which is a major part of aircrack-ng. I know that this has all been done before, but I wrote this because of the lack of actual documentation of it. But upon reading it’s unable to implement packet-injection, it looks like I’ll have to keep waiting for an interesting iPhone app to pull me into the purchase. Guess no one’s hacked it into the wifi drivers yet. Use android and download/make your own. Unlike the iPhail you can actually write your own software without big company approval. @leithoa, thanks for the second link, i’ve been wanting to see that. The first one was actually some of the inspiration for writing this. I’m assuming that since the author mentions using snowbreeze to create a custom firmware to allow for a bigger root partition that this would be incompatible with the iPhone 4? @felix, I have read that one can load Debian, but doesn’t one lose the phone functionality? I guess it’s fairly useful, portable, and discreet for recon, but I don’t think you’ll be doing too much actual penetration with it. Still, I loved Ettercap when I was into this stuff, and I can think of a few pranks and a few more malicious things that portable ettercap would be useful for. Oh, and I think Nmap should absolutely be on the list. I looked into this a while ago but all the apps available seemed to be in just PoC stage. Any possibility of this on Android? Nokia N900 is capable of injection. Just sayin’.